Opera Omaha opened its doors in 1958 with Giacomo Puccini’s Madama Butterfly . Since then, a more impactful production of this classic was not seen until the spring of 2006 when local artist Jun Kaneko designed the set and costumes. The city went crazy. Kaneko’s vision was lauded across the community. As if Omaha’s love wasn’t enough, the show hit the road, and Kaneko got rave reviews from Vancouver to Atlanta. But the artist knows his roots, and Kaneko’s Madama Butterfly came back to close as Opera Omaha’s final production of the 2010-11 season. If you missed it, you truly missed something special, starting with this year’s cast. Gerard Powers was a plastic and superficial Pinkerton, exactly how this opera villain should be portrayed. Jason Ferrante and Mika Shigematsu were perfect supporting roles in Goro and Suzuki, respectively. Mihoko Kinoshita’s incarnation of the title character, however, was simply exquisite. The true test of a Butterfly is the audience’s reaction to her infamous final scene. For Kinoshita, the Omaha opening night audience became quiet as a morgue, and this is the audience who, until that point had a collective case of severe whooping cough. In my row, the only movement was the uncomfortable shifting of adolescent males who had probably not dealt with emotion of that magnitude and the slow tracing of tears down my face. Everything the cast did was enhanced perfectly by Kaneko’s set and costumes. Truly, the visual presentation is another character in the opera. 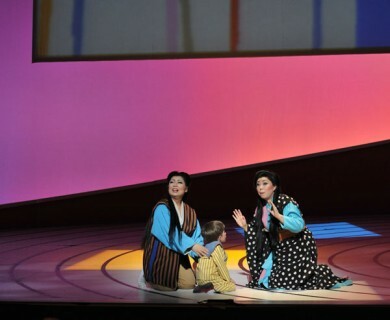 Kaneko’s use of vivid color in bold and simple expressions matches flawlessly with Puccini’s music. The Japanese influence on both artist and composer serves as a unifying element. One of Kaneko’s most innovative ideas was the use of screens to portray scenes, particularly between the second and third acts when so much happens mentally and emotionally for Butterfly, and Puccini’s music takes the audience on that journey. The only criticism of Kaneko’s work is the black silhouette image of an American war ship that floats across the screens. It’s too literal for the otherwise abstract and conceptual set. Despite one minor flaw, Kaneko’s set and costumes sublimely capture Puccini’s timeless opera. Hopefully, Kaneko’s interpretation of Butterfly will be revived for future productions. It’s too perfect to let collect dust.